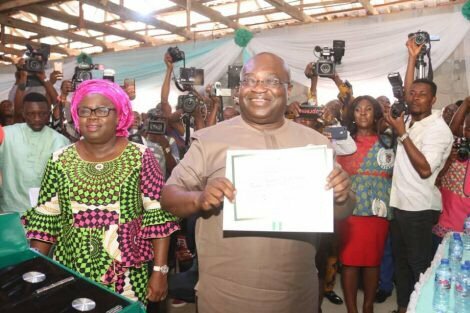 Governor Okezie Ikpeazu of the Peoples Democratic Party, PDP, was declared winner of the 2019 gubernatorial election in Abia State, after polling the total number of 261,127 to defeat Uche Ogah of the All Progressives Congress, APC, and Alex Otti of the All Progressives Grand Alliance, APGA. The State Deputy Governor, Rt. Hon. Ude Oko Chukwu and 24 members-elect of the Abia House of Assembly also received their Certificates of Return from the electoral umpire. Congrats to them all. Okezie Ikpeazu your victory is embedded on fraud, I know you didn't deserve to be reelected but fortunes smiled on you. You can right your wrong in this chance given to you again else posterity will place you on the wrong side of history. Clean the city of Aba and make it motorable. Let Aba be the hub of commercial centre in Africa. Pay your workers adequately and as when due. So that Abians will be proud of you and the party. Abians vhave not gotten it right when it comes to governance. Congratulations oga and madam ikpeazu. In this your second term, please clear the arrears you owe pensioners to avoid curses from our elders.